We love Macs. We adore the Apple logo. We know it's not just "some kind of fruit company"! So now, as I test my PC for some Mac Mac-king, I will provide you the list of sites that I found very useful. 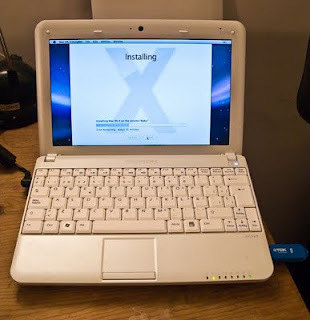 Hackintosh is a term used in the Apple Macintosh user community to mean different things throughout that platform's lifespan, but now generally referring to the use of Mac OSX on non-Apple hardware. Currently, the most common Hackintoshes are Intel based, although some programmers have made kernel patches to work on AMD-based computers. Prior to the Apple-Intel transition, the term most often referred to an Apple-manufactured Macintosh computer that its owner had performed various hardware hacks on. The alt.hackintosh Usenet newsgroup gives its description as "Clever programming on Apple's Macintosh." Before you begin it is better for you to know a few things first. Your system should have some decent requirements. Running OS X(pronounced as OS Ten) on low end PCs is certainly not recommended. In fact it probably will disillusion you. Respect the status of the OS and install it on machines with decent hardware. This is experimental. Hundreds have done this, true, but still if it doesn't work, dont blame Apple, or the Mac Hackers(or me!). And please make sure you have made backups of your hard drive. Be prepared to be disappointed because several drivers may not work with the OS. This is NOT a limitation of the OS itself but the fact that you are forcibly running a hardware specific Operating System on custom hardware. Use legal OS X. You don't want to be a pirate. Max OS Lion is out and costs about 29$. It is worth every penny. Buy it instead of ripping it off some torrent site. Try to buy a real Mac sometime in the future. The design is superb. perhaps that itself is an understatement.